Powerless. Lenovos 11.6-incher is the cheapest alternative to the Acer Timeline X 1830T. The Core i5-520UM is a disappointing choice when it comes to performance, but how does battery life fare with the equipped 48Wh battery? How about the display and waste heat? Big surprise here: eSATA. 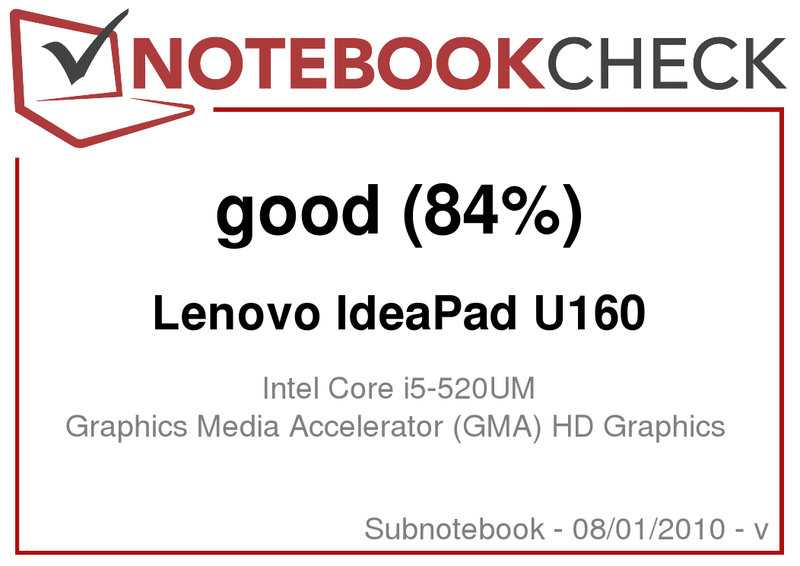 IdeaPad U160-M436GGE with Core i5-520UM: Real competition for the Aspire 1830T? 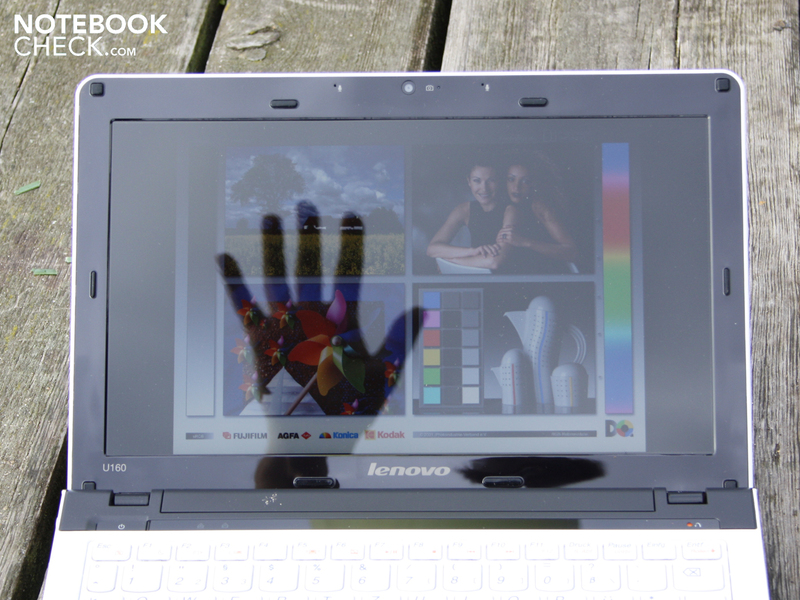 Lenovos Idea Pad U160 is an 11.6-incher currently available for 499 Euro. For the price, the manufacturer fits a Celeron U3400 in the thin case; for 100 Euro more, a Pentium U5400 can be optioned. We tested the Sony Vaio VPC-Y21S1E in this configuration and truth be told, we were not exactly wowed by its subterranean performance. We did not want to lead a performance comparison using two performance-weak models, thus we obtained the attractive performance-version with a Core i5-520UM. For 675 Euro the IdeaPad U160-M436GGE is in direct competition with Acers Aspire 1830T-52U4G32n, though the latter is a good 100 Euro more expensive. 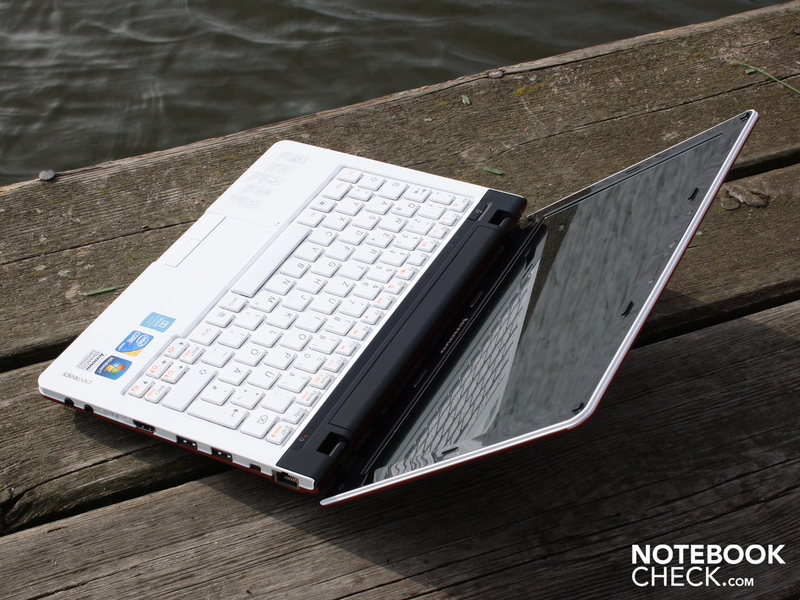 We put to the test if the savings potential is enough to swing buyers away from the Aspire 1830T to the IdeaPad U160. 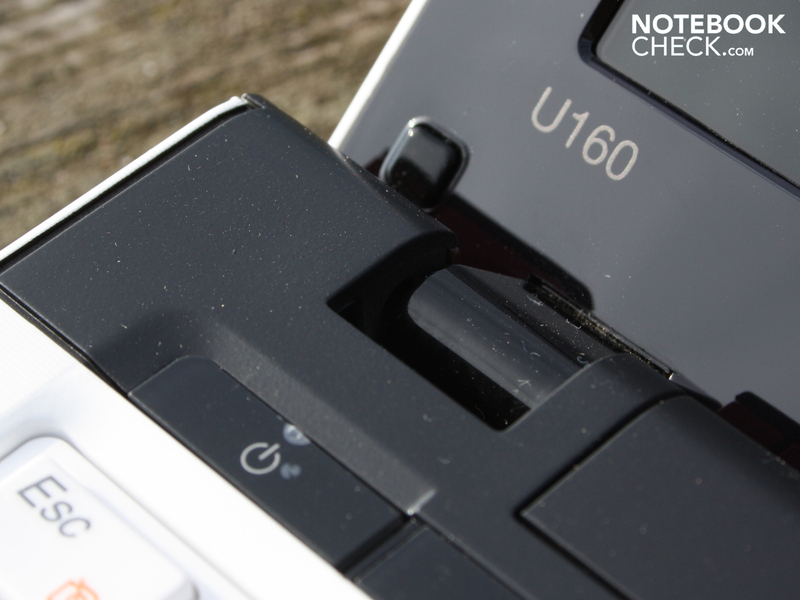 Though features such as eSATA-connectivity, a rarity in subnotebooks, could be a force to be reckoned with, the decisive factor will be if the U160 can put up similarly good battery life and ergonomic values as the highly-rated Aspire 1830T-52U4G32n. 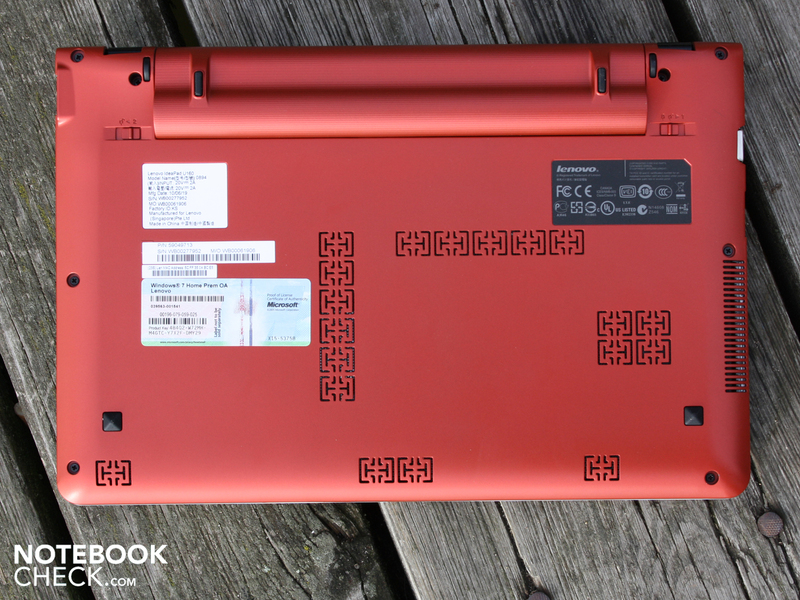 The look of the 11.6-inch subnotebook is, if anything, a bit exaggerated. 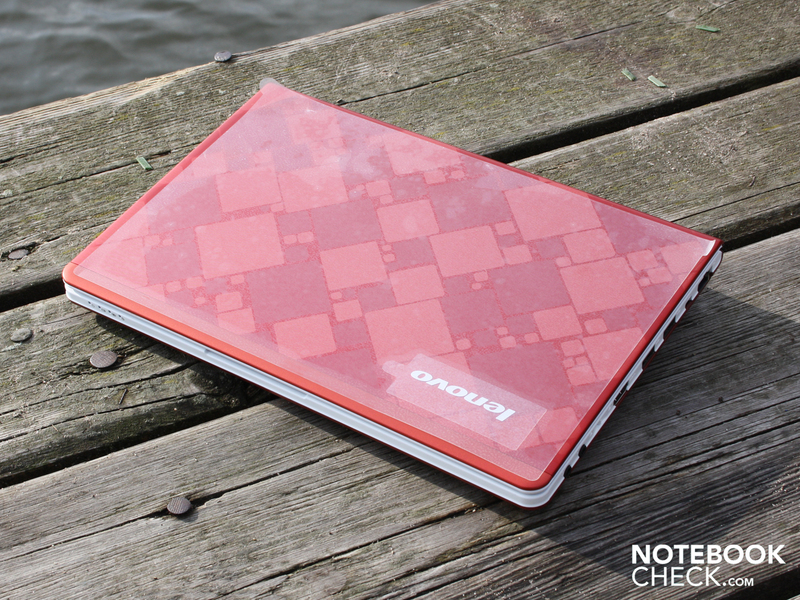 Following in the footsteps of the IdeaPad-series, handsome patterns and loud colors still dominate here. This is however not to say that the whole package does not look good; on the contrary, the U160 presents itself with surprisingly premium surfaces. Outer lid and footplate have a metallic finish, even if it is only the outer lid that is finished in aluminum with a pressed-on pattern. The red footplate is made of a very hard lacquered plastic. The work surface is made of a finely structured plastic with a corregated surface. Thanks to this the palm rest retains somewhat of an anti-skid feature and is also comfortable to use; over longer periods of time dirt will accumulate in the corregations and will have to be cleaned. For the time being at least, the battle against fingerprints has resulted in a victory. The red aluminum lid is not only eye-catching, it is also very stable (torsional test). Light pressure on the lid-surface does not lead to any indentations being formed. 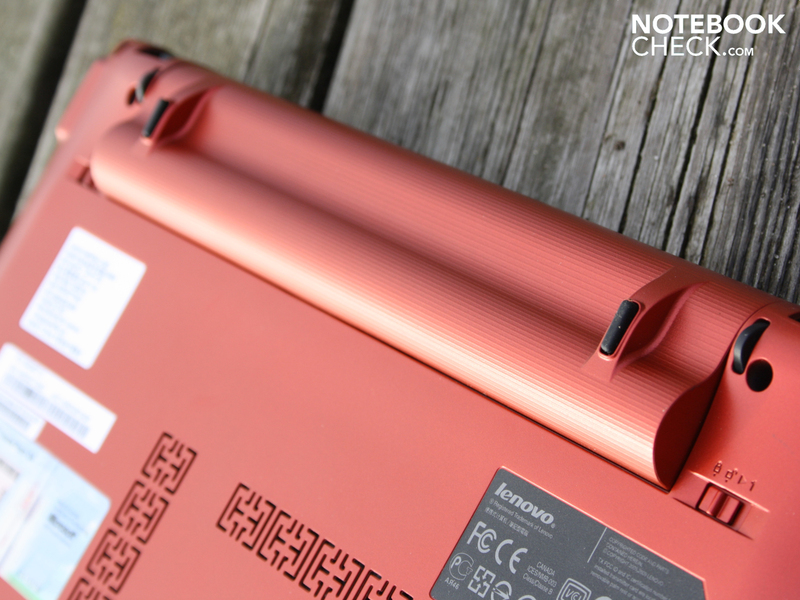 Lenovo once again proves that pretty notebooks without high-gloss surfaces are entirely possible, though the U160 does not escape the high-gloss monster in its entirety. 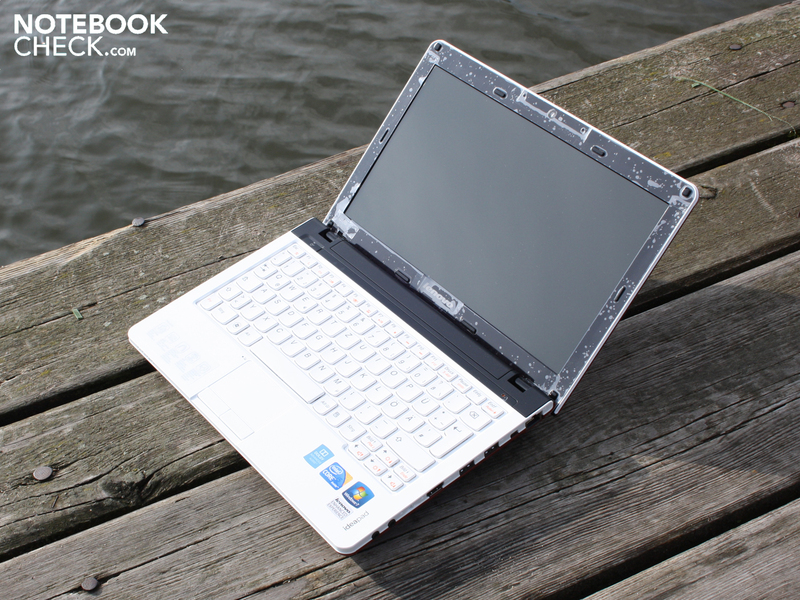 The display bezel and glare-type panel give the notebook a glossy appearance from the front. On the topic of stability the construction can be described as good to very good. The surfaces of the palm rest and the area over the keys and on the underside are firm and do not give under pressure in any areas. What we especially liked was the homogeneous matte surface on the underside. There are no hatches or panels for hard drive or memory access, rather a stiff and stable chassis throughout. 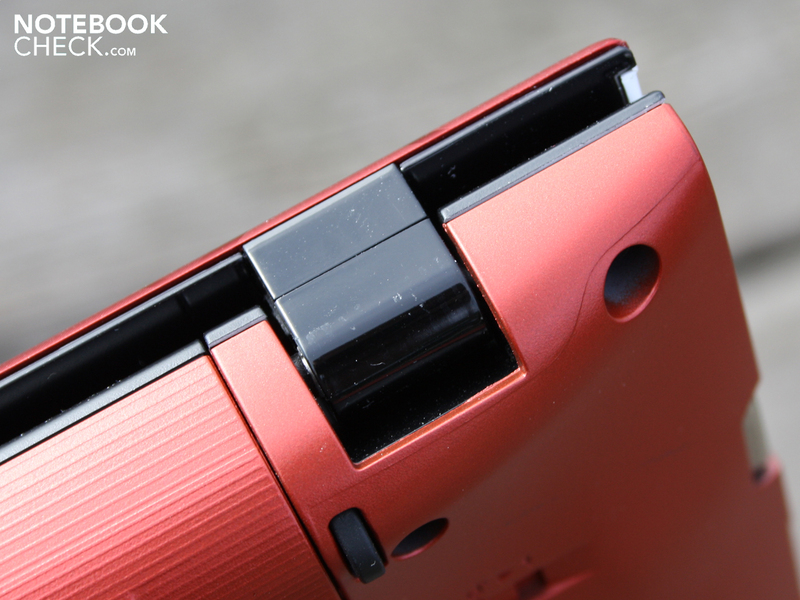 No praise here for the battery, as it moves around a bit in its slot. The Elpida-RAM as well as the hard drive can be swapped out for other models. In the instruction manual there is conveniently a guide to do just this. After removing multiple screws, the keyboard, and a few additional screws the complete bottom plate can be removed. 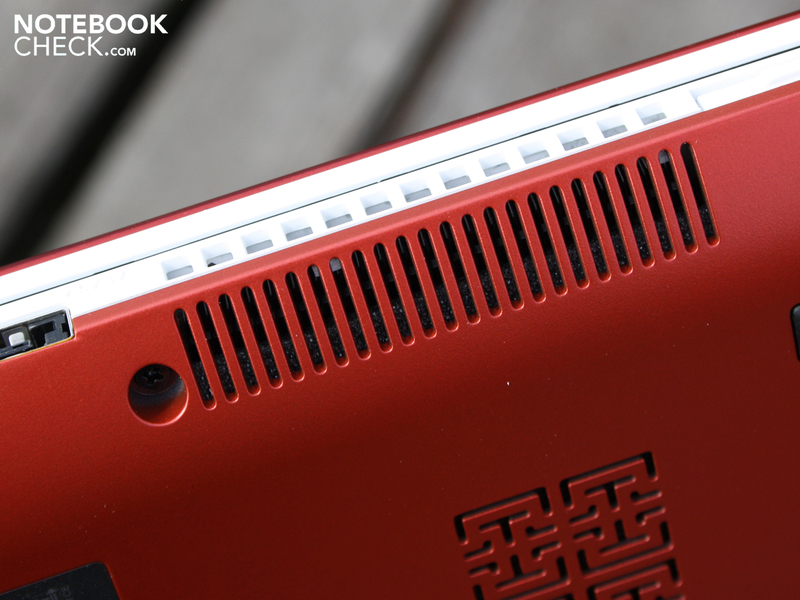 Underneath the 2.5-inch HDD and DDR3 RAM slots can be found. Both hinges on the outer lid are strongly affixed. Due to this, the display sits firmly in every position. When agitated (traveling on a train or by car) the screen moves back and forth slightly. The joints have a good maximum opening position of almost 145 degrees. The hinges, however, do not have the same stiffness in this maximum position as they do in others and the movement of the display is clear to see. Thanks to two magnets in the palm rest and in the display bezel, opening the lid should require a bit of force to overcome the resistance--unfortunately this isn't the case, as the lid has a tendency to stay propped open a bit. 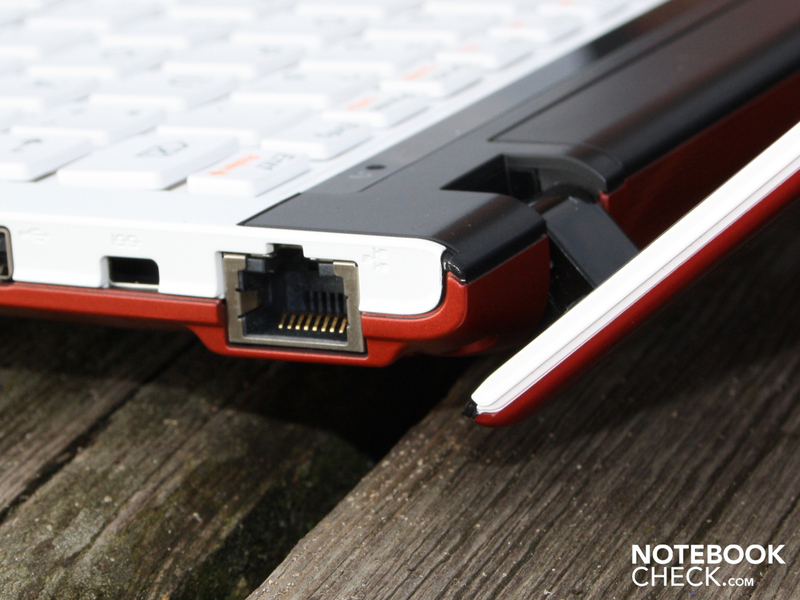 The Lenovo U160 is two ports away from being completely identical to the Aspire 1830T. Though the 1830T has one-up with the addition of a SPDIF audio-out, the U160 offers an eSATA-port. It is up to the buyer to decide which of these two ports is the more attractive of the two options. eSATA serves to connect high-speed external hard drives. 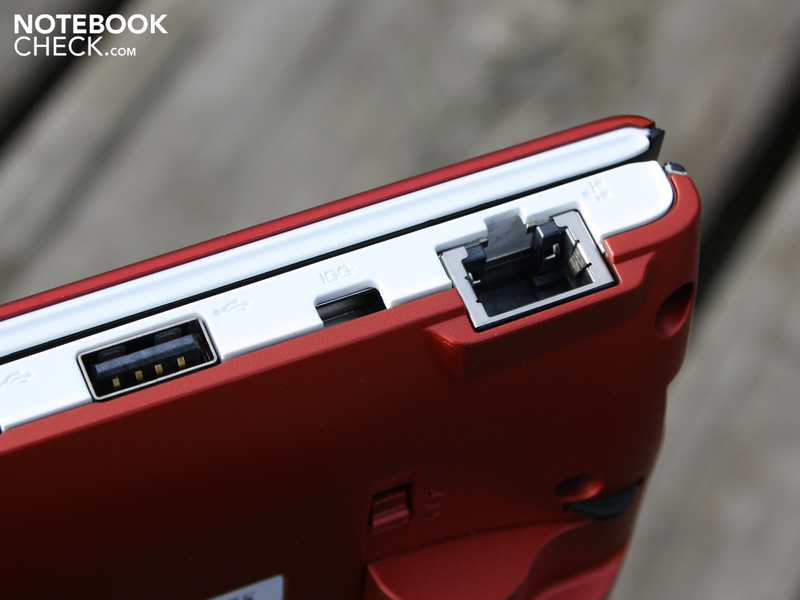 Large quantities of data can be exchanged back and forth to the built-in 320GB hard drive via this port. Was a USB port sacrificed for the sake of eSATA connectivity? 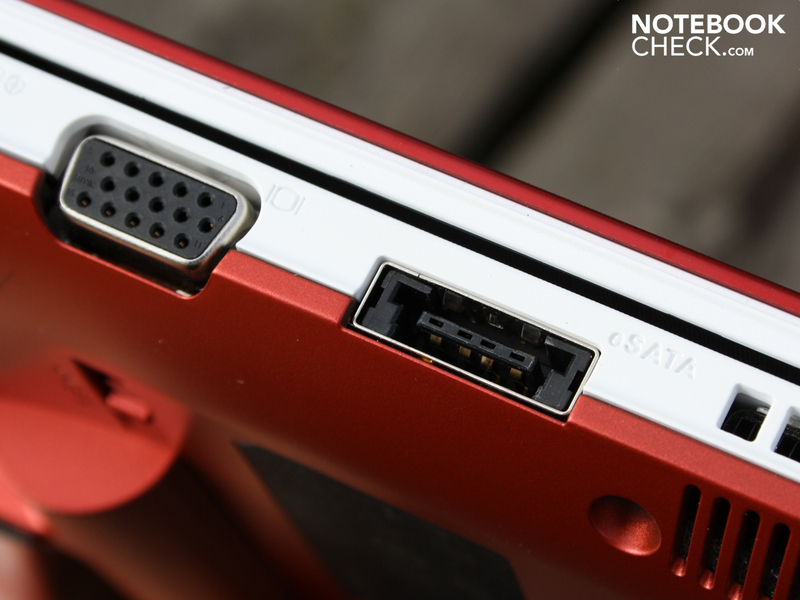 No, as eSATA is combined with USB 2.0, 3 USB ports are available in total. Apart from this are also HDMI and VGA, allowing the connection to televisions and external monitors. The free-standing keys have an expansive layout but a small key-size. 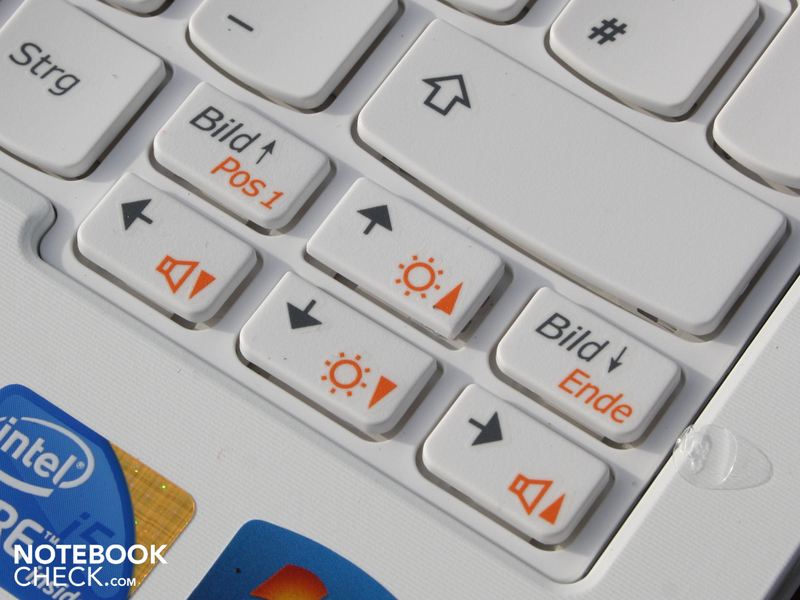 Particularly pleasing to the eye is the thin but still practical enter-key. 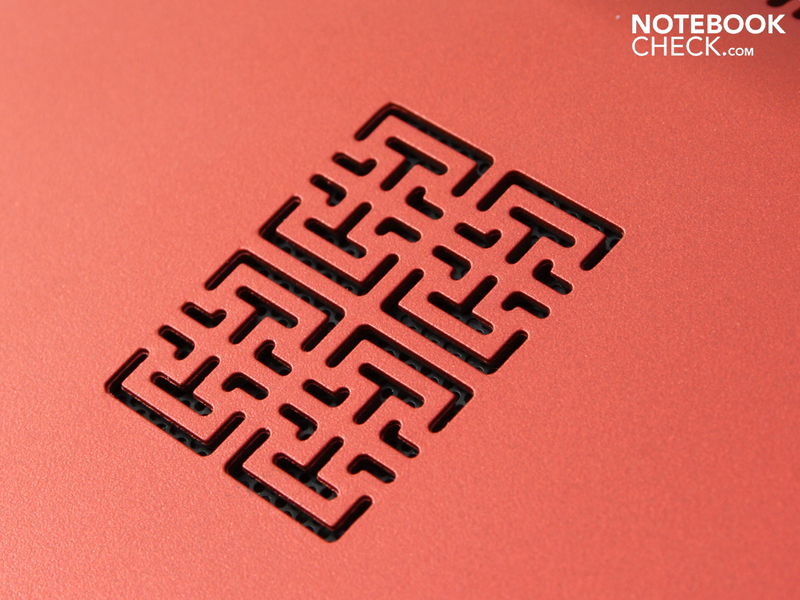 The key surface is nested securely in the chassis; users can expect a firm (but not hard) feedback. The typing accuracy is raised through small conical indentations in the keys, ensuring that fingers stay on the key they are meant for. The pressure point is very clear though the key hub is relatively small. This lends the keyboard a bit of a wooden (and not always comfortable) feedback. In actuality, this is nothing that cannot be gotten used to. 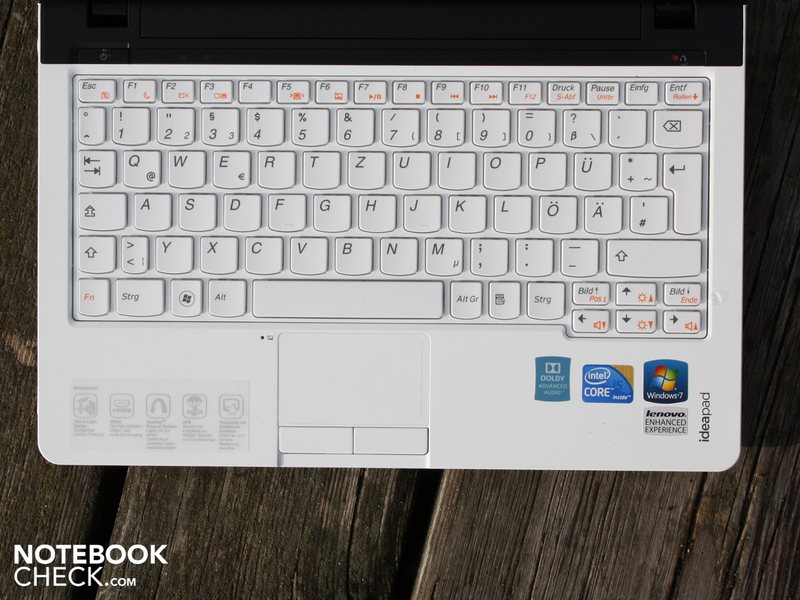 At any rate, the U160's keyboard supersedes the spongy one at home on the 1830T. The touch pad is situated in the palm rest area and offers the finger a comfortable degree of friction resistance. Next to the pad is a sensor for its automatic deactivation; if the sensor is covered by the hands when typing it turns the touch pad off, thus preventing false inputs. Turning the pad completely off is a matter of the Fn-key. The mouse pad is user-friendly thanks to its quiet operation and distinct key hub. A pressure point per se isn't to be found, though we don't miss a feature like this when using the mouse pad in a quick manner. 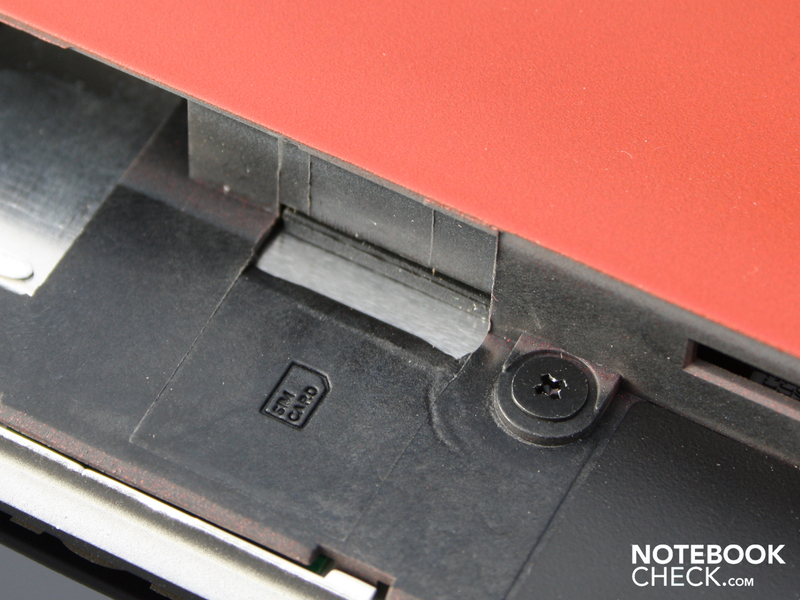 The keys remind us of those on HP's business-notebooks, only that the keys here are not rubberized. 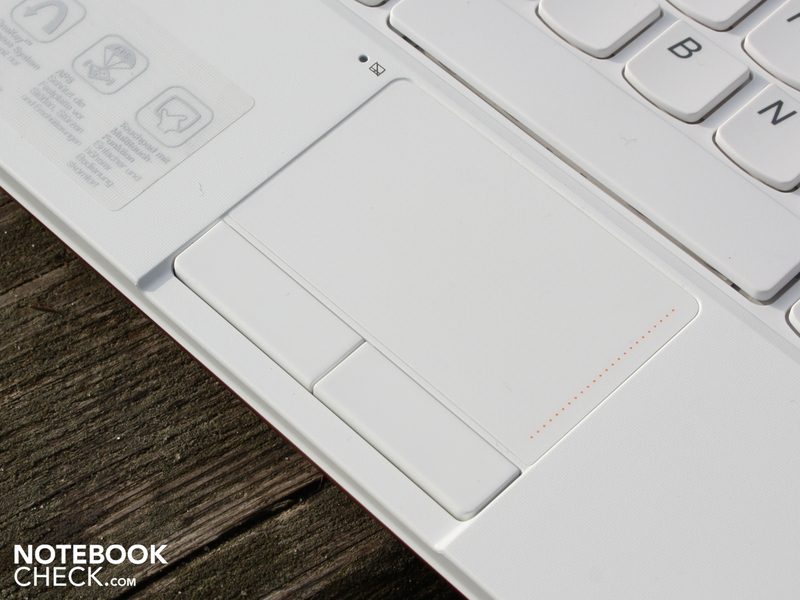 The multi-touch pad (Synaptics TouchPad V7.2) is able to recognize inputs with two fingers (two-finger gestures). As such, we are able to zoom in using two fingers. A vertical scroll is available and optically marked on the pad. Horizontal scrolling, however, must first be activated through the Synaptics control panel. The 11.6-inch (29.46 cm) display used here makes comparison with the Timeline X1830T very simple. The U160 actually features the exact same panel type as the Timeline model: CMO N116B6-L02. The very similar brightness and contrast values as well as the identical viewing angles will be explained below. The panel has a native resolution of 1366 x 768 (HD ready), a very high resolution for the 11.6-inch form factor. In contrast to the typical netbook resolution of 1024 x 600 the on-screen real-estate is enormous here. 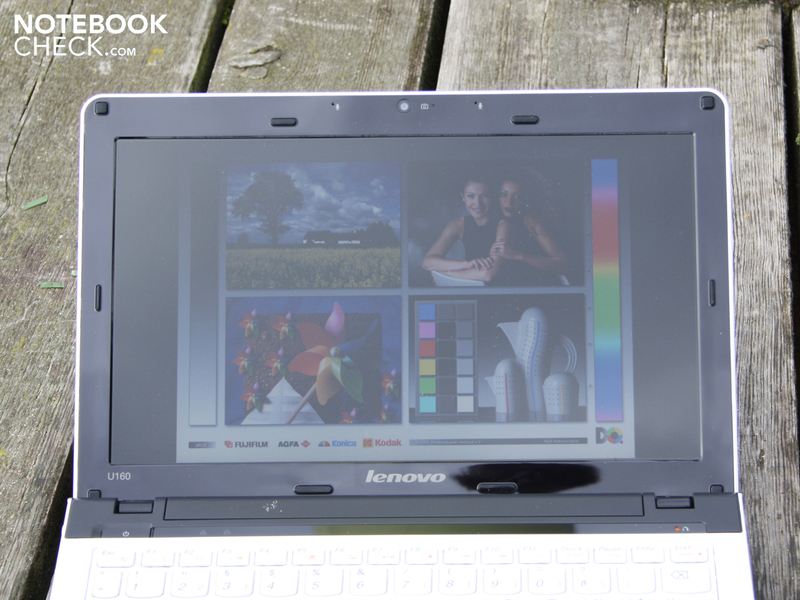 HD-ready is also the standard resolution in 14-,15- and 16-inch notebooks. The CMO-panel is not matte; the glare-type panels are better at color reproduction, though reflections are inherent in their operation. The contrast level of a display separates the wheat from the chaff: here a ratio of 150:1 gives us nothing but chaff, which is not surprising. 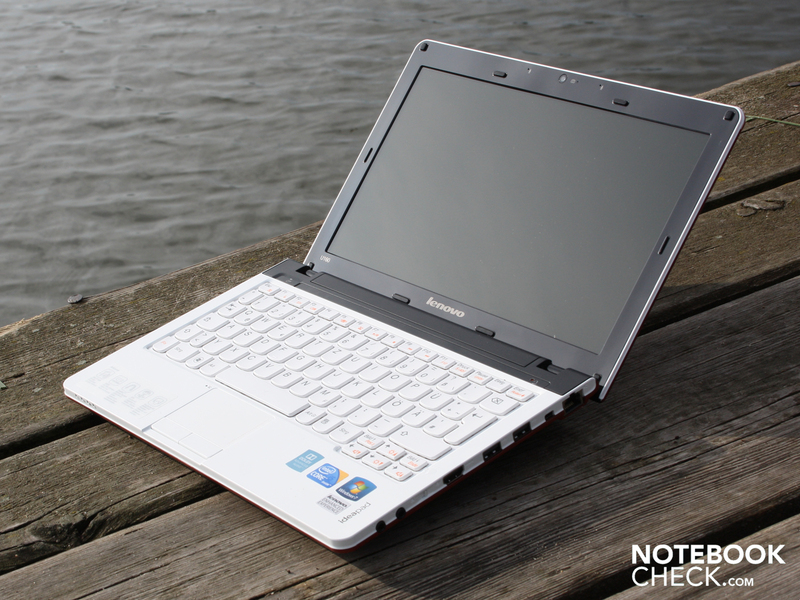 Many of the cheaper netbooks, subnotebooks and notebooks have contrast ratios under 200:1. Darker colors are not deeply infused with black, rather a lighter shade of gray. The brightness of the TFT lies at 221 cd/m², an average for the entire panel, which is a good value. As such, users do not have to turn up the brightness when indoors and can safely dim the display down a bit. An illumination value of 91% is relatively even; this value measures the difference between the brightest and darkest areas of the display. During battery operation the brightness remains stable. The beautiful weather invites us outside for a little time in the sun. 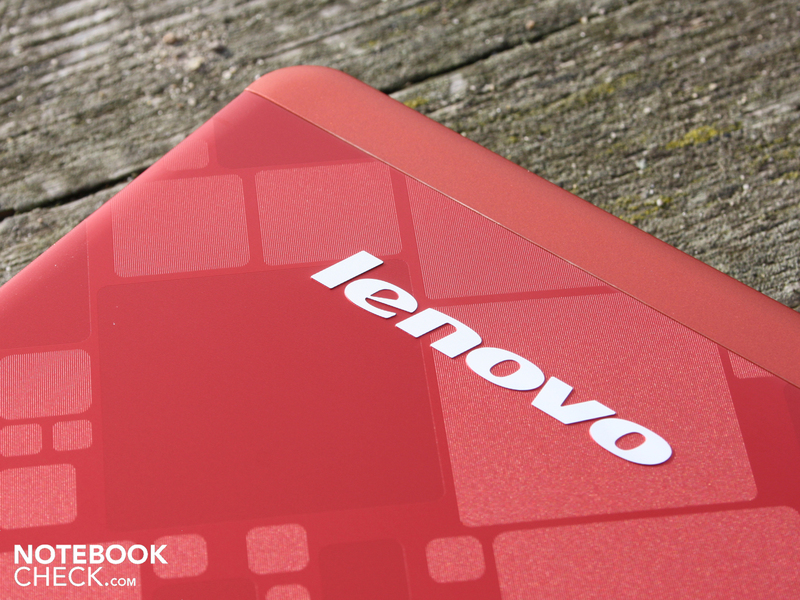 Of course one would want to bring along the slick red Lenovo U160 with them; quickly the sun reflecting off the panel gets on one's nerves. The brightness puts up a good fight against the brightness itself, though it is powerless when it comes to the reflections. Comfortable operation in sunlight is only possible when one is in the shadows or when going through the trouble of finding an appropriate seating position and display angle. The horizontal viewing angles are relatively tolerant. Up to 45 degrees deviation from the optimal position we were still able to recognize text and colors, though soon after the colors start to become inverted. The picture begins to darken as quickly as 25 degrees deviation from the optimal position. From above or below things look a bit worse (vertical). Text is readable up to 40 degrees and the brightness starts to decrease as soon as 10 degrees. When an audience is gathered in front of the IdeaPad, those looking on from an upper position will hardly be able to recognize anything. With as little as 25 vertical degrees of deviation the colors are strongly inverted. The energy-efficient ultra-low-voltage variant of the Core i5-520M with the name i5-520UM is at home in the U160. The CPU has the same performance features as the standard version (Hyper Threading, Turbo Boost). The standard- and turbo-frequencies are however much lower. The dual-core processor is clocked at between 1.06 and 1.86 GHz (Turbo-Boost). The maximum wattage of 18 Watts (TDP) is admittedly high. The chip also contains the memory controller as well as integrated Intel HD graphics. The integration of both these components into the processor structure is standard on the new Core i3 and i5 CPUs. The 520UM is able to work on four threads in parallel (Hyper Threading), which should be a benefit when working with multi-threaded applications. HT supplements each physical core with a virtual one, a feature missing from the Core 2 Duo CULV/ULV processors (SU7300, SU9400, SL9400) processors. A 2.5-inch, 5400 rpm hard drive from Western Digital with a capacity of 320 GB is on duty here. Working alongside with the Intel HM55-chipset is speedy DDR3 memory (one 2 GB module). 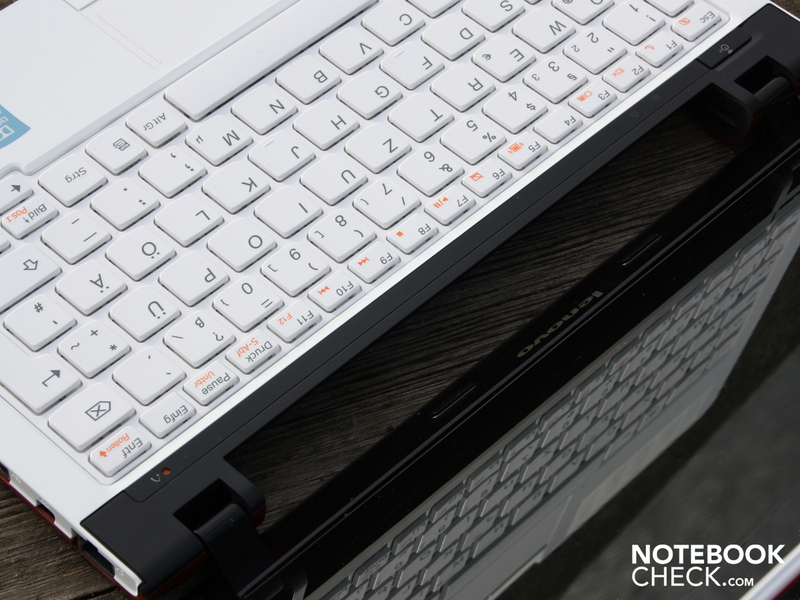 Here we discover a second difference between the Timeline X 1830T and our test model: the 1830T has 4 GB of DDR3. Turbo Boost for single-core applications and Hyper-Threading (HT) for multi-core applications. 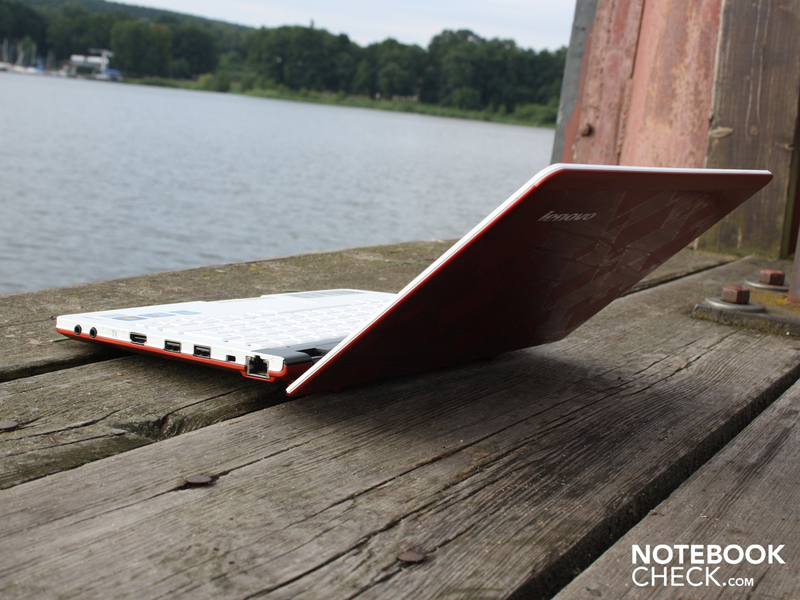 Does the U160 have the power of a full-on notebook? The question can be ignored, as 1.86 GHz in Turbo-Boost is not enough to keep pace with the laptop performance coming from a Core i3-330M (2 x 2.16 GHz, Turbo Boost). We use the synthetic processor benchmark Cinebench R10 Multi/Single (32 bit) to compare the CPU with other processors. During a multi-core benchmark with all available threads (HT: 2 cores + 2 virtual cores) the i5-520UM scores 2785 points. This is measurably less than the same CPU in the Acer Aspire 1830T (3368 points). In every case the U160 processes about half as fast as the Core i3-330M (2.16 GHz) with 5,500 points. The older brother of this model, the 520M (2.4 GHz) is higher still at 6,700 points. 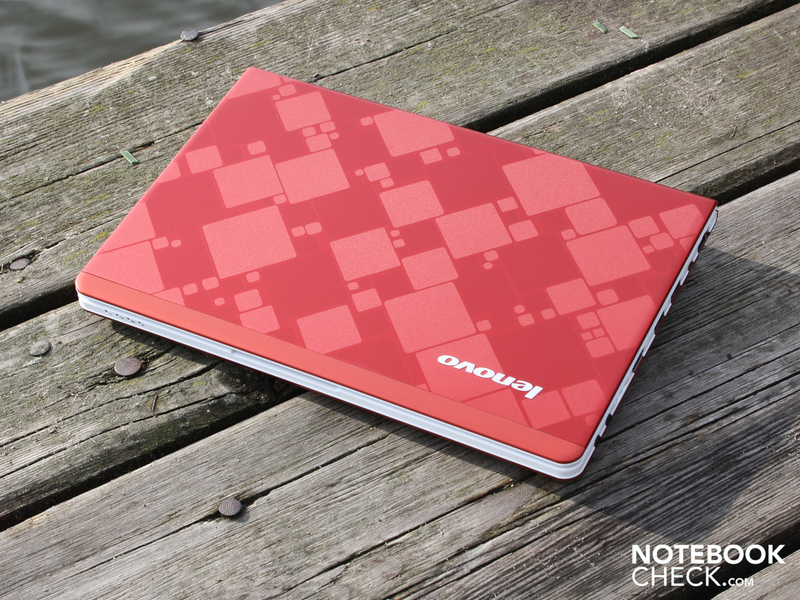 When computing with one core (single-core) the Lenovo U160 manages 1,471 points. The Core i3-330M lies around 2,300 points, while an i5-520M is able to put up 3,050 points. Interesting is that an overclocked 520UM scored 2,545 points thereby snuffing out the i3-330M (Asus PL30JT). The 520UM in the Timeline X 1830T is faster with its 1,928 points. Compared with ULV processors of the previous Core 2 Duo generation, the current CPU doesn't hold much water. The U160 just squeaks ahead of the SU7300 (1.400/2.650; Single/Multi) though it can't quite catch the SU9400 (1.500/2.900; Single/Multi). Is the Core i5-520UM in poor shape? To what do we attribute the weak performance of the i5-520UM? All processor and system benchmarks henceforth executed have suffered from its slow processing speed. We tested with the single-core benchmark SuperPi as well as Cinebench R10 and found the hard evidence: the Turbo Boost of the U160 clocks the processor both irregularly and not as high as the Turbo Boost in the 1830T. While the U160 is quick to change between 1.09 and 1.4 GHz (four threads), the 1830T stays relatively constant at 1.6 GHz (single core). The same goes for multi-core calculations in Cinebench: the U160 persists at standard frequency of 4 x 1.09 GHz while the 1830T calculates in Turbo-mode at 4 x 1.46 GHz. See the series of screenshots for more information. There are no options in the BIOS for activation/deactivation of HT or Turbo-Boost. Is the system performance also on par with that of a low-level subnotebook? A PCMark Vantage score of 2,979 points clearly points to yes. Previous systems featuring the older SU7300 CPU like the Sony Vaio VPC-Y11S1ES or the Asus UL30A are just as well off with scores between 2,700 and 2,900. The low score is in line with the low results from the CPU-benchmarks. The comparison model, the Timeline X 1830T is much faster with a score of 3,950 points. The Western Digital hard drive (type WD3200BEVT) with a capacity of 320 GB (5400 rpm) is a normal 2.5-inch notebook HDD. HDTune revealed sequential read times on average reached 67.5 MB/s. This average is very good among comparable 2.5-inch hard drives. 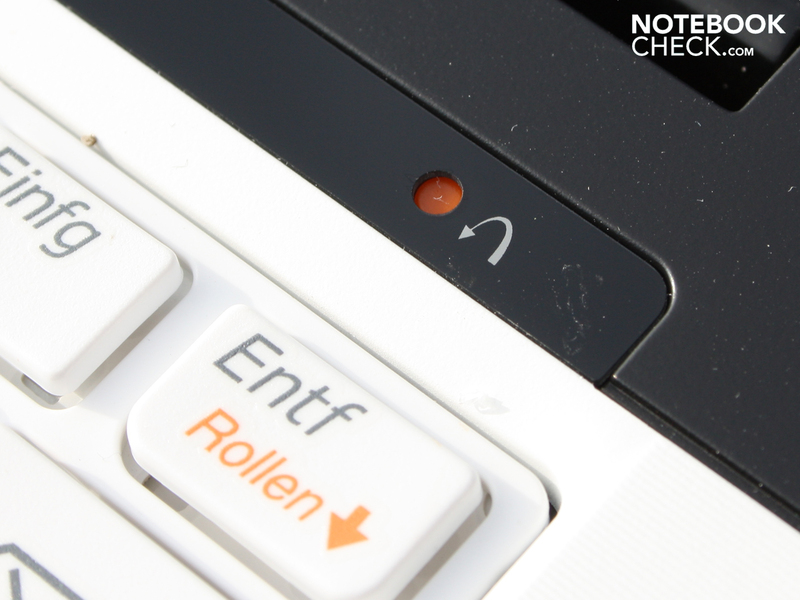 When it comes to the emission of noise, Lenovos 11.6-incher is the same as many Office notebooks. When surfing, sending email and typing the cooling fan spins at 33.7 dB(A). At the lowest setting, meaning without load and at idle, the active cooling is off most of the time. Here, the only thing that can be heard is the fine whirr of the hard drive at 30.2 dB(A). Annoyingly, there is a discreet whistling which is audible when the fan is on, irrespective of fan speed. When we turn up the heat and put the Core i5-520UM through its paces in processor benchmarks, the noise rises to 33.3 dB(A). A 3DMark2006 benchmark stresses primarily the Intel HD graphics, while the noise remains in a tight range. Only when the processor (Prime95) and GPU (Furmark) are stressed simultaneously does the noise rise to 37.1 dB(A). 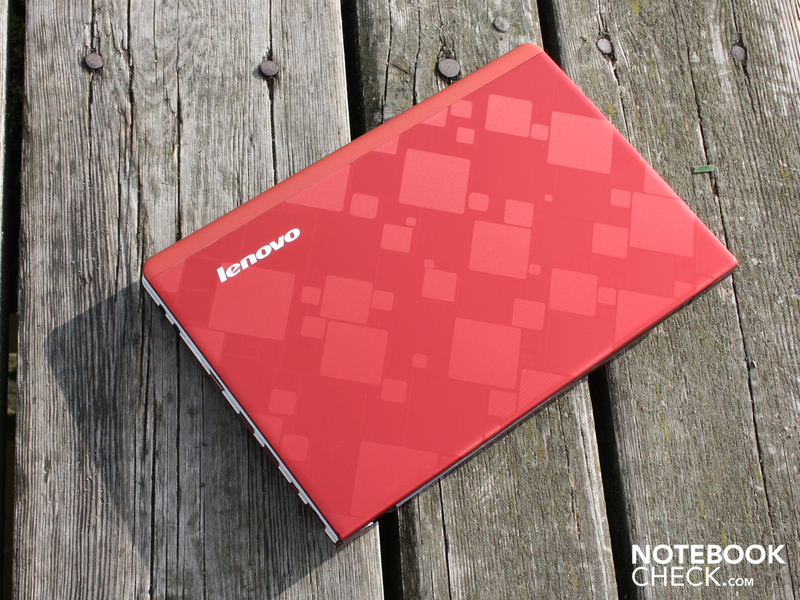 With regards to waste heat the Lenovo U160 manages a bit better than Acer's 1830T. At idle the temperature on the upper surfaces averages 34 degrees Celsius (top side) and 37 degrees Celsius (bottom side). Even the bottom panel periodically sees temperatures of 44 degrees Celsius when not under stress. 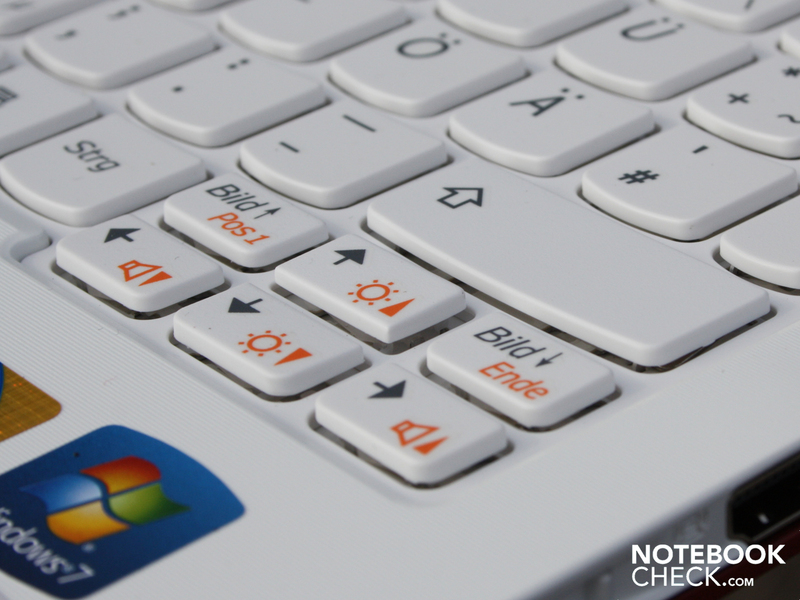 Those operating the notebook in a typical office scenario (web surfing, downloading files, unpacking zip-files) does not have to worry about the temperatures described above at all. 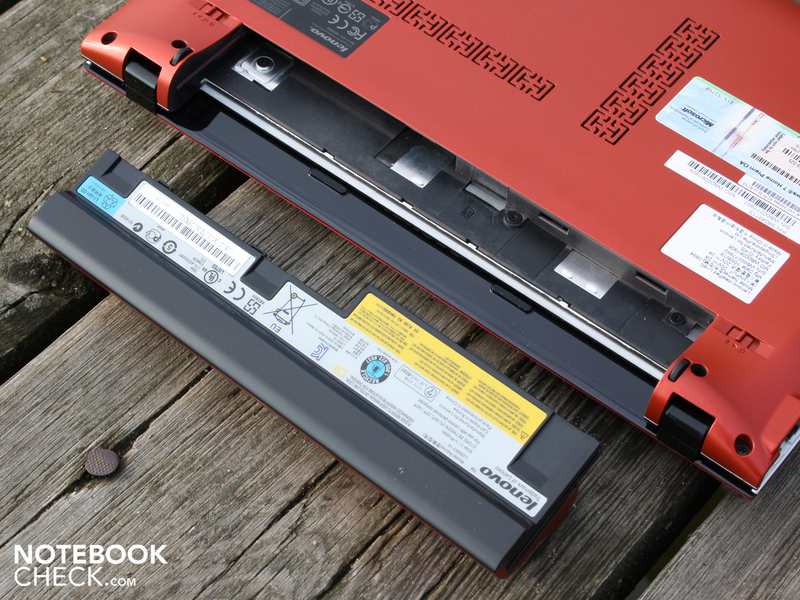 The constantly active fan prevents a thermal backup in the chassis. Thus, the temperatures on all surfaces fall significantly. The idle temperatures occur thanks to the switching of the cooling fan on and off, allowing heat to build up in the chassis. Under constant stress during a stress test comprised of Prime95 and Furmark things in the 11.6-incher can really heat up, most of all the work surface. Here we measured temperatures on the left side of 43 degrees Celsius, with an average of 37 degrees. Inner sensors register 67 degrees Celsius at the processor. This value and the idle temperature values of 46 degrees Celsius are in the normal ranges and are of no reason for concern. 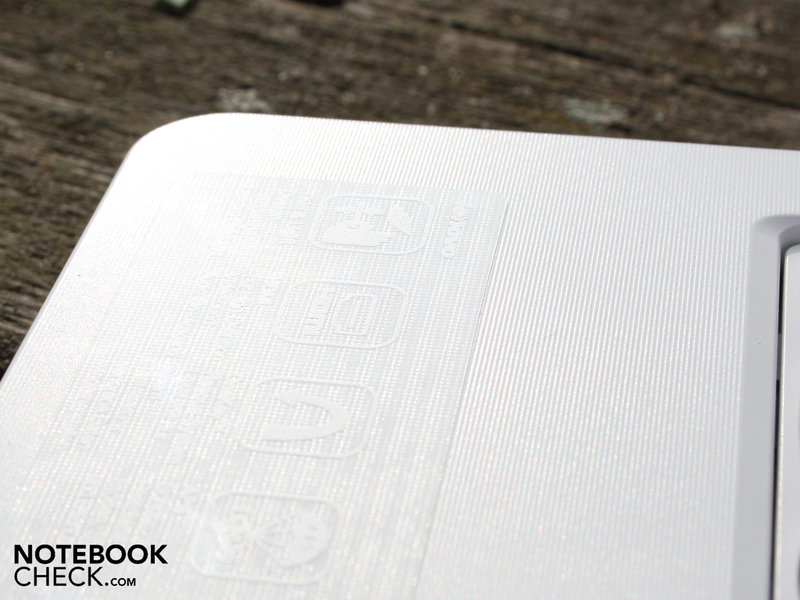 (-) The average temperature of the palmrest area of similar devices was 28.6 °C / 83.5 F (-8.3 °C / -14.9 F). Lenovo fitted the chassis with Dolby Advanced Audio, the Dolby Audio Enhancer for which can be found in the control panel. This should allow the highs to sound more crisp and the bass to drop an octave lower. The results of this fidgeting are measurable. While the sound image with any variety of music without the Dolby Enhancer produces a shuddering effect in the mid-range, the Dolby adjustments make deep tones audible. Undemanding users should have no problem listening to their music via the two speakers mounted under the palm rest. The speakers are not particularly loud and a scratching of the speaker membrane was always audible at the loudest setting. The connection of an external speaker system with the 3.5 millimeter jack is perfect for music lovers. We tried the analog-out with two active Yamaha speakers (YST-M20DSP) and were unable to find any unpleasant sounds present in the transmission. When it comes to the run-time, the Lenovo U160 lies behind the competition from Acer (Aspire Timeline X 1830T, 520UM-configuration). 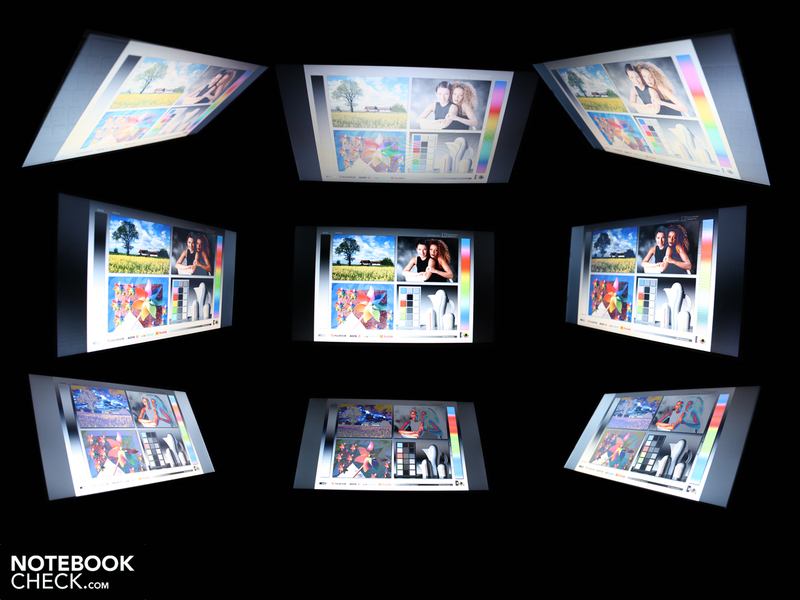 Depending on the demand on the notebook from the user, the expectations of a subnotebook may still be met. Four hours (225 minutes) is possible when surfing via WLAN while at 100 cd/m² brightness. The 1830T managed almost five hours (287 minutes). Those surfing via a UMTS surf-stick have it a bit worse off. After 151 minutes (2:31 hours) the 11.6-incher is at the end of useful life. The surf-stick requires more energy for transmission as the internal WLAN does. We were able to watch an AVI film streamed from the hard drive for 3:43 hours before we ran out of steam. This is exactly an hour less of film enjoyment as the 1830T. At idle (this means not under stress) with deactivated wireless and lowest brightness the Lenovo U160 can go a distance of 5:55 hours (335 minutes), a passable but wholly unrealistic result. Under constant CPU-stress of 100% (BatteryEater Classic, high-performance energy mode) the battery is empty in the shortest amount of time. After 2:20 hours under stress the battery is totally empty, requiring 2:41 hours to recharge completely. Film from HDD 223 min. Fitting with respect to the average battery life is the energy consumption, higher than the Timeline X 1830T. 8.2 Watts at idle doesn't sound like a big number, though the 1830T is able to do the same thing while using only 6.5 Watts. This extra 20 percent requirement helps to explain the poorer battery life of the U160. The consumption under stress confirms the low-performance of the 520UM that we saw earlier. A 3DMark2006 benchmark uses 23.8 Watts (1830T: 26.6 Watts) and a stress test with Furmark and Prime95 revealed 26 Watts (1830T: 30.3 Watts). Were the i5-520UM to process in full Turbo-Boost mode, the energy consumption patterns would be 90 percent identical with those of the 1830T. 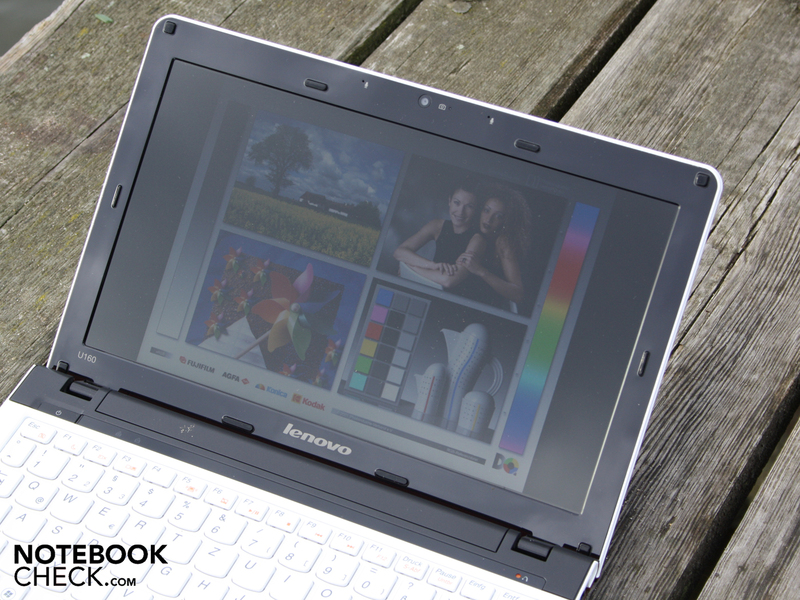 Lenovo offers its smallest subnotebook in interesting configurations available from 499 Euro. 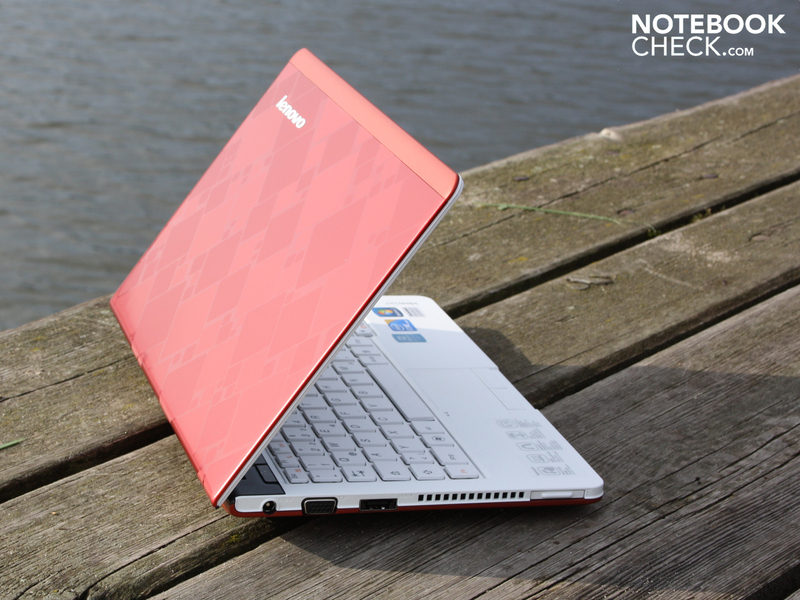 Our Lenovo U160 M436GGE was representative of the high-end version with a Core i5-520UM (from 675 Euro). The computing performance should have been on par with that of the Acer Timeline X 1830T (11.6-inch), though an improperly functioning Turbo Boost feature prevented the i5-520UM from reaching its full potential. All processor, graphics and application benchmarks have arrived at this same result. This does not mean that the Lenovo U160 is totally unusable. Its performance unfortunately lies on the same level as its predecessor from the Core 2 Duo generation, the SU7300. And this processor has neither Turbo Boost nor Hyper Threading! The battery life is, at four hours (WLAN-surfing), under the average but still respectable for its size. The weight of 1.387kg (including the 4,300 mAh battery) plus the light 159-gram AC adapter) is quite conducive to working when underway. That said, annoying reflections in the glare-type display are present in conditions with strong light sources. The 11.6-incher also doesn't make the best impression when it comes to heat dispersion. At idle the chassis warms up too much thanks to a deactivated cooling fan. 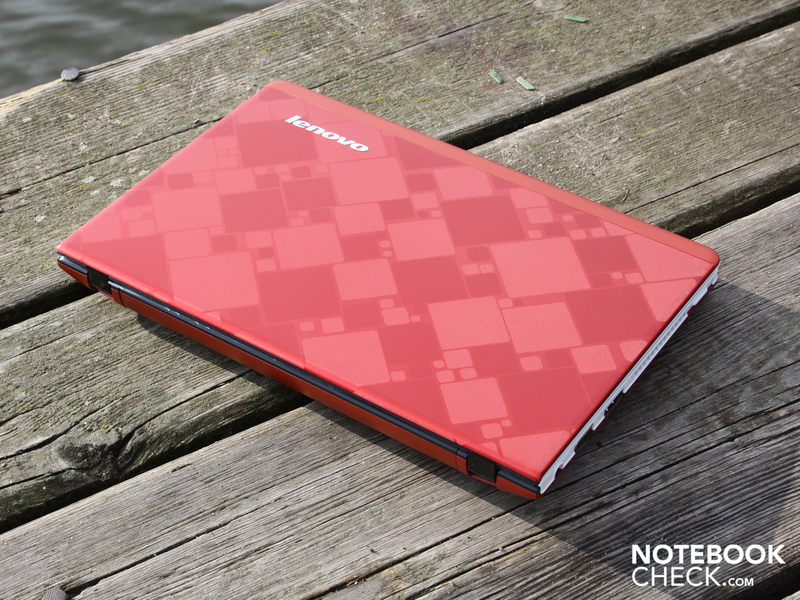 The Lenovo U160 is an attractive choice thanks to an eSATA-port (for fast external hard drives), excellent typing response from the keyboard and first-class mouse buttons. Those on the fence between the Aspire 1830T and the cheaper Lenovo U160 and are at the same time irritated by the low processor scores should look elsewhere. If this incorrectly-functioning Turbo feature really is the culprit, the i5-520UM variant of the U160 is not recommendable. There are alternatives available with Celeron U3400, Pentium U5400, Core i3-330UM, Core i5-430UM and Core i7-620UM processors. Lenovos 11.6-incher is can be had for as little as 499 Euro. And of course the glare-type display. and HDMI, are all hallmarks of a thought out mini-computer. Connectivity also includes eSATA (not pictured) and RJ45 (LAN). The protruding battery is good for around four hours of operation. 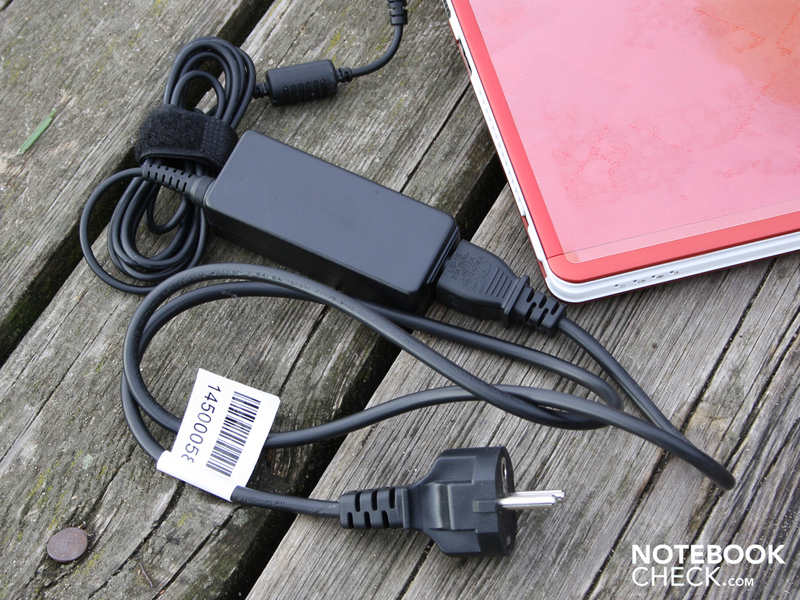 Which is certainly passable for a 4.300 mAh battery. Under the battery is a slot for the insertion of a sim-card. and puts out 40 Watts. Which, for the maximum consumption of 26 Watts is well-dimensioned. The otherwise matte surfaces, are only interrupted by the TFT bezel. The maximum angle is sufficient for working with the device on your lap. but have the lid firmly in their grip. Intel Core i5-520UM - available in the U160 from 675 Euro. The nicely patterned outer lid is protected by a film. and is not sensitive to smudgy fingers. The look continues on the underside, made of a hard lacquered plastic. Panels for the exchange of the HDD or RAM are not available. These openings are for the introduction of fresh air. 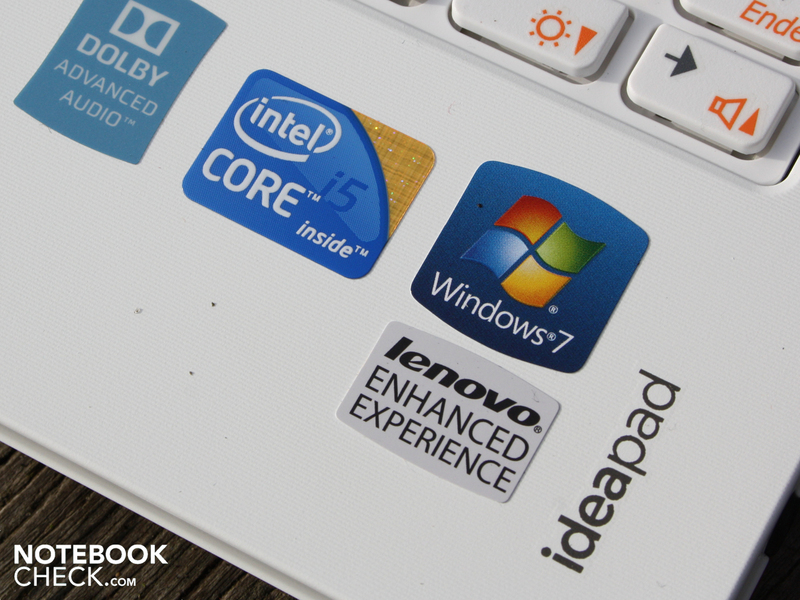 IdeaPad U160-M436GGE: Beauty is only skin deep. An eSATA-port on a subnotebook. Those with large quantities of data will appreciate that. A matte display and a more powerful battery would have helped the run time a bit. The poor performance of the i5-520UM in all benchmarks. The otherwise good U160 is in poor shape when it comes to this. A defective chip? 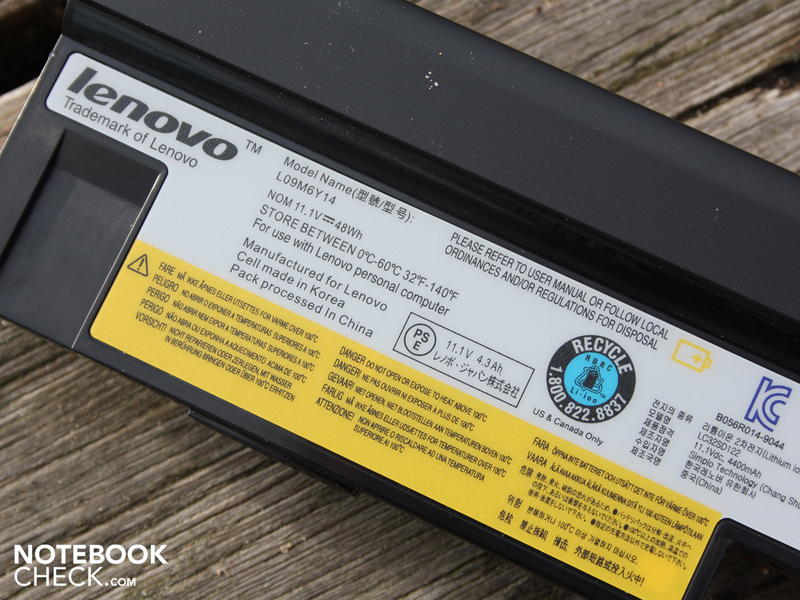 Or did Lenovo dial down the juice in favor of better battery life?